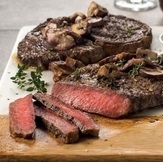 21 day aged Rib Eye - This steak is also known as the Rib Steak. Each steak is approximately 1/2 lb and the total weight will be a bit more than the lbs you order. Each order will contain 2 individually wrapped steaks.